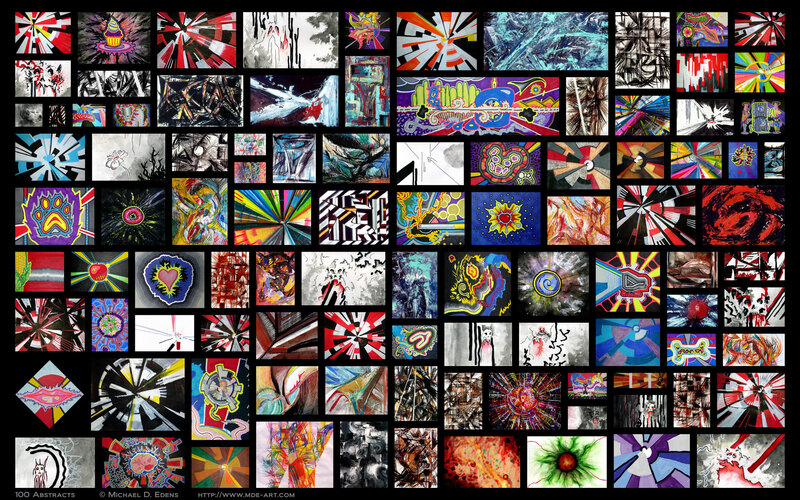 Photo collage of 100 Abstracts; artwork by Michael D. Edens over a period of about 15 years. The abstract artworks were created in a variety of styles and mediums including paints, charcoal & pastels, pen & ink and digital. 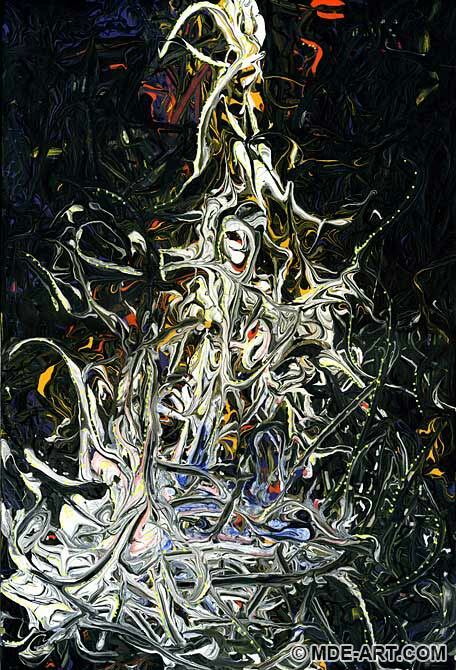 Styles include abstract impressionism, expressionism, surrealism and blends of expressive techniques. The drawings and paintings range in size from a few inches to several meters. 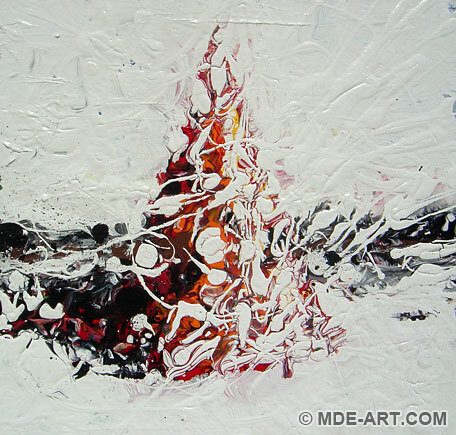 This is an original abstract artwork entitled “Falling Apart (process)”. The artwork is approximately 4′ x 5′, and was created with a mix of acrylic paint, spray paint, charcoal, chalk, and pastels in 2012. Small photographs are aligned in a row below the artwork, documenting the painting process over the course of about an hour per image until the final artwork was complete. The following abstract artwork is “Untitled”. 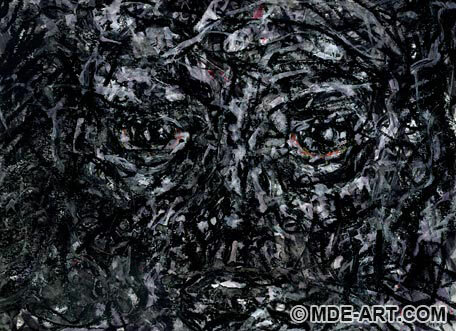 The size is approximately 5’x6′, created with a mix of charcoal and acrylic paints. I thought for a few minutes between each brush stroke. I paced myself, letting the next action flow naturally rather than forcing a preconceived idea of what I wanted to paint. If nothing came to mind, I didn’t paint. After a while, nothing called me to put more paint on the paper. So I took a picture and set it aside. I like the way the painting keeps my eye moving through it… searching. These three abstract expressionism artworks are a series of 17″x21″ drawings created with charcoal, chalk, and pastels. The inspiration is primarily emotional and nihilistic; meditations on the imprint of life in an abstract expressionist style. 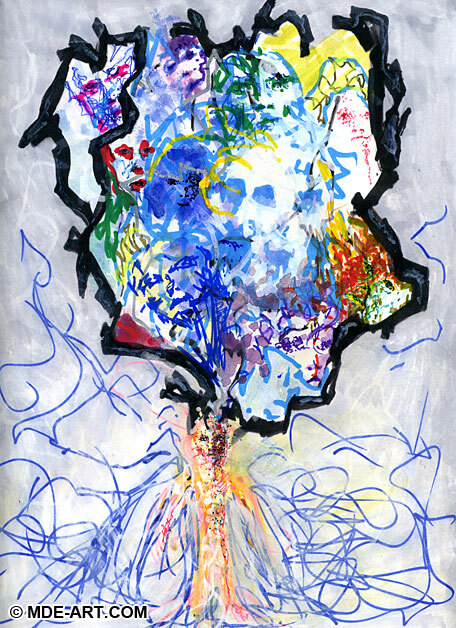 This is an abstract drawing of a tornado. The 19″x25″ artwork was drawn with charcoal and pastels. 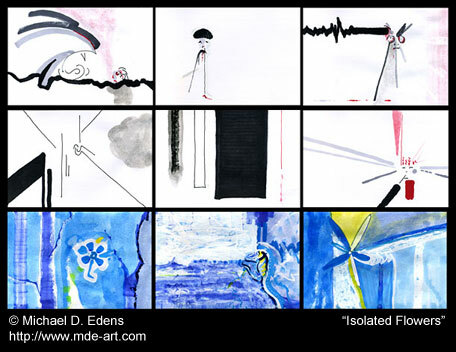 This is a series of abstract drawings entitled “Isolated Flowers”. 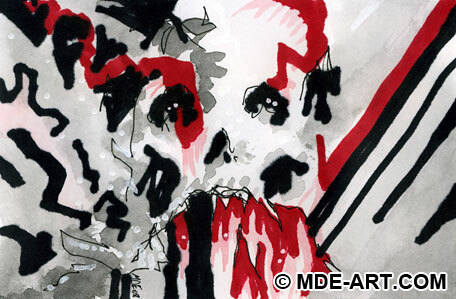 Each individual drawing is 4″x6″ and the entire series is approximately 13″x18″. The mediums used to create the artwork include pens, markers, watercolors, acrylics, and oil pastels. 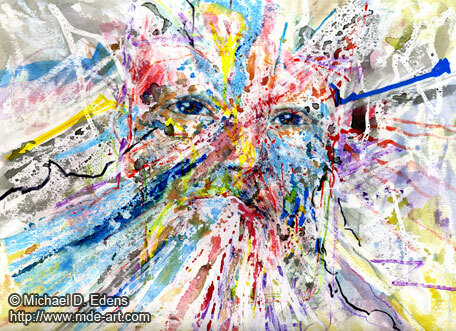 These are two self-portraits of/by artist Michael D. Edens. 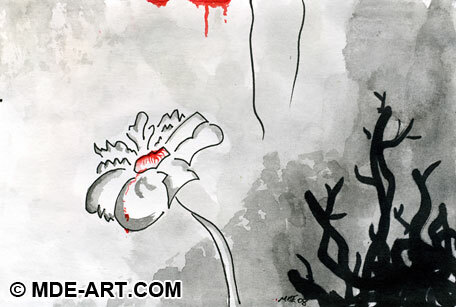 The 9″x12″ artworks were drawn and painted in 2011 with a variety of mediums. 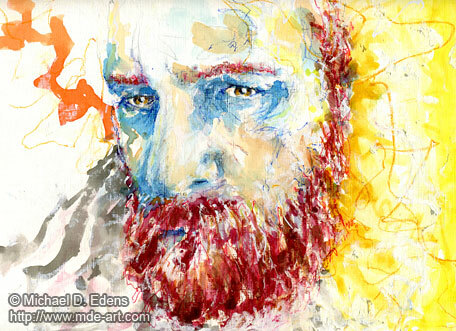 The first self-portrait, entitled “Self-Portrait”, was drawn with pens, oil pastels, paint pens, watercolors, and gouache. 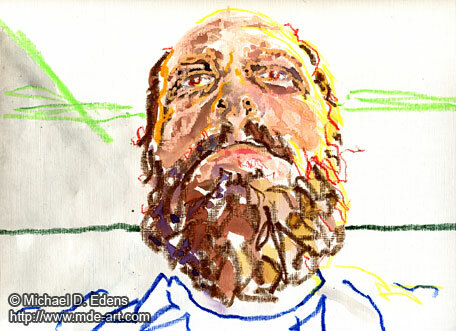 The second self-portrait, entitled “Uneasy Self-Portrait”, was drawn with colored pencils, oil pastels, and watercolors. Unique layering and coloring techniques were used in each self-portrait in order to create interesting visual styles. 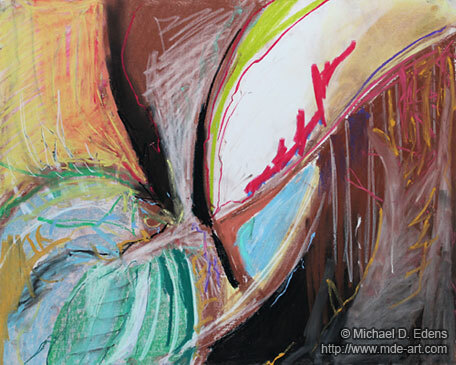 For example, watercolors are painted over naturally repelling oil pastels to create an uneasy imbalance of organically flowing swirls and pooling colors amidst irrepressible lines. 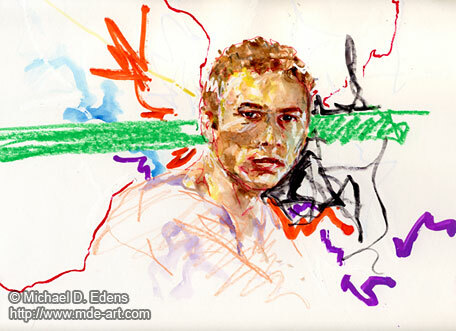 This is a previous 9″x12″ self-portrait created as part of the Rainbow Color Portraits – Series 1. 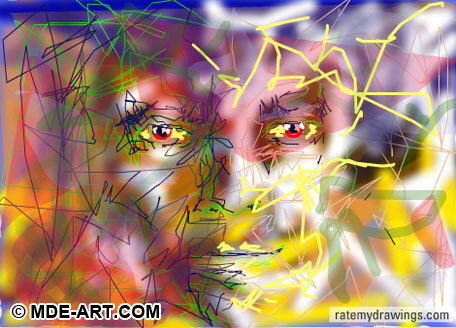 This is an abstract drawing and painting of a face. 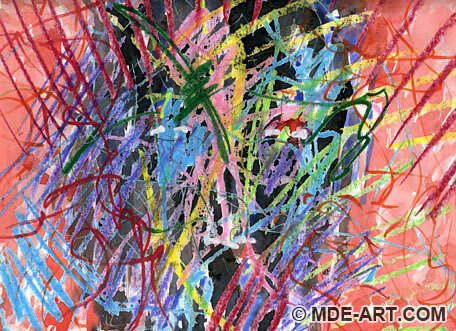 The 9″x12″ abstract art was created in 2011 with a variety of mediums, including paint pens, colored pencils, crayons, watercolors, acrylics, oil pastels, markers, pens, and gouache. 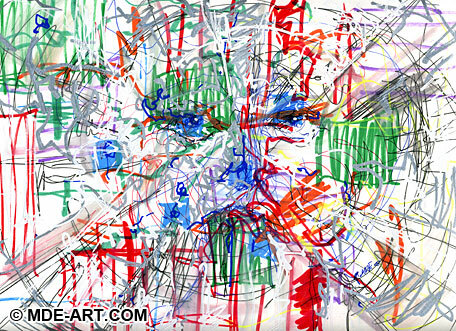 Expressive application of vibrant colors, meandering lines, and layered white space mix to create a determined facial expression forming on the paper. 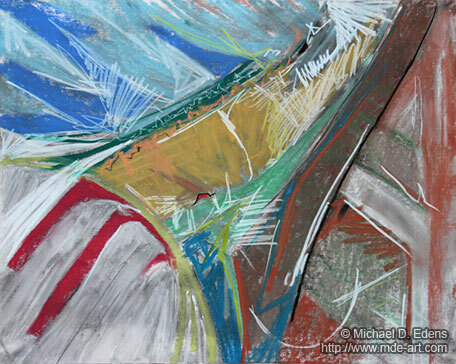 This is expressive abstract art I created with pastels in 2004. 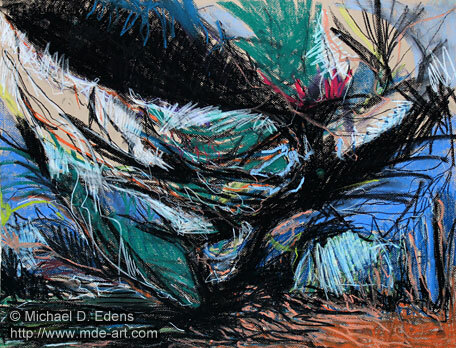 The colorful drawing is 9″ x 12″. The artwork is a tightly wound, but energetic, array of color and slight variations in texture. The artwork is entitled “Joy” and is comprised of unique abstract geometric shapes. 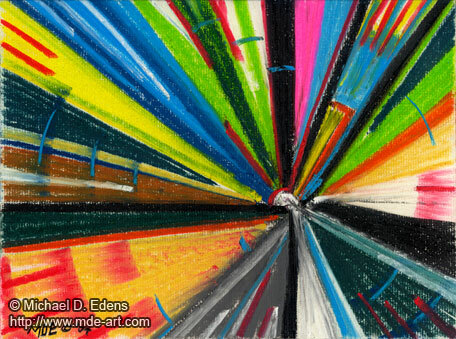 Please contact me, Michael D. Edens, if you would like to purchase a high quality print of this artwork. The following drawings of the sun (stars) were created in response to Art Challenge #7: Sun Art, over at The Artist Challenge. 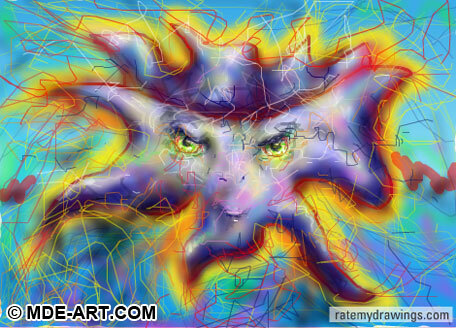 The first sun drawing is also part of the CBS News Sunday Morning Television Show Art Library. Each sun drawing is 11″ x 14″, and drawn on paper with a variety of pens, watercolors, paint pens, colored pencils, oil pastels, markers, and acrylic paint. The first image of the sun represents the power and energy of the source of light and color, and life, in our world. The drawing is also abstract and impressionistic. 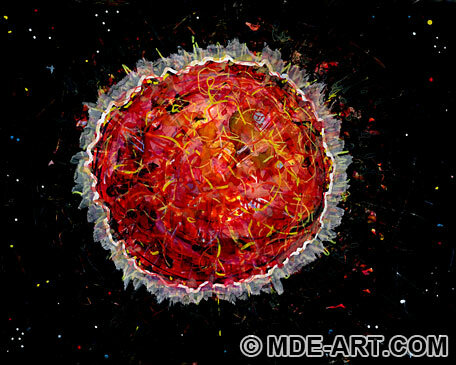 The other two sun/star drawings focus on the tumultuous bubbling reaction within a star that produces the warm colors and heat amidst the black depths of space. 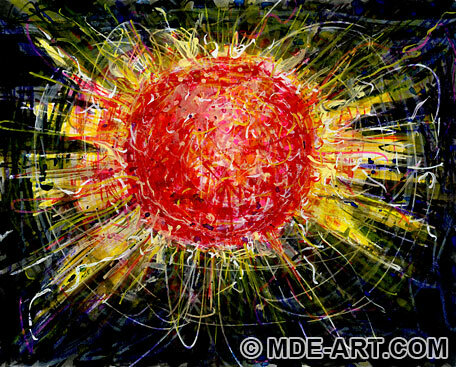 The accompanying video shows the drawing and painting process for the colorful abstract sun in a time lapse format. The Artist Challenge is well underway, with new artists joining every day! The project was started by artist Vikki North and I by challenging each other to create artwork based on a particular theme. This is my submission for Art Challenge #5 – Unrequited Love. 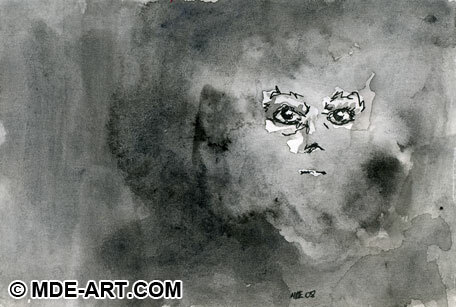 The first artwork is my submission, “Face of Unrequited Love 01”. 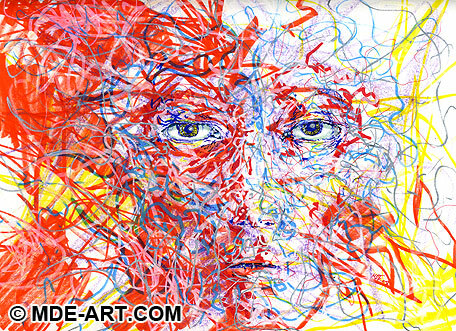 The abstract face drawing/painting is approximately 11″x14″, drawn and painted with pens, markers, colored pencils, and watercolors on paper. The accompanying video shows the drawing and painting process in a time lapse format. 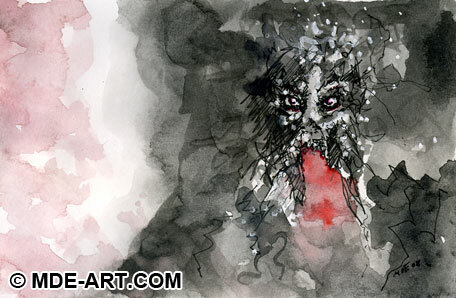 The face was initially sketched with pen and markers. Washes of water and watercolor softened the portrait, followed by thick markers, and more watercolor washes, details, and highlights. 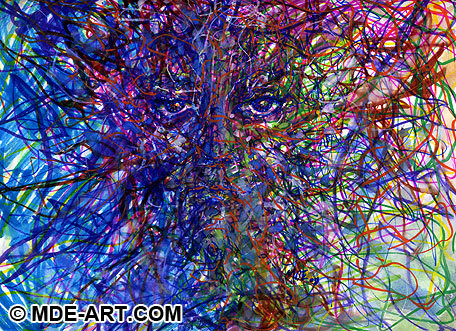 The second portrait drawing is entitled “Face of Unrequited Love 02”. 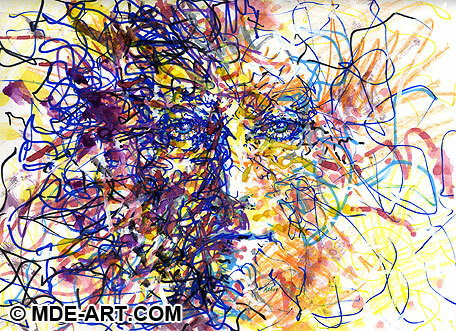 This abstract face drawing/painting is approximately 9″x12″, drawn and painted with pens, markers, colored pencils, and watercolors on paper. There is an accompanying video that shows the drawing and painting process in a time lapse format. It shows a similar sketching and painting process from start to finish. 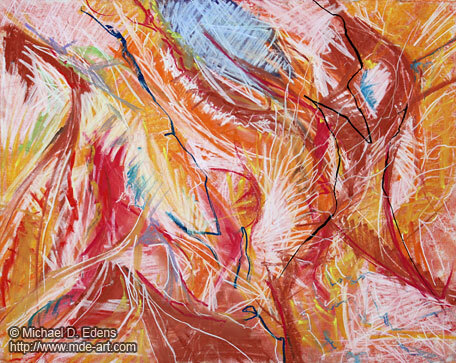 This an abstract painting created with acrylic and watercolor paint. The artwork is approximately 16.5″ x 11″ on heavy foam core. Sweeping movements were used to wisp the paint onto the surface, and instead of using the brush, the brush handle was used to push and pull the paint around. 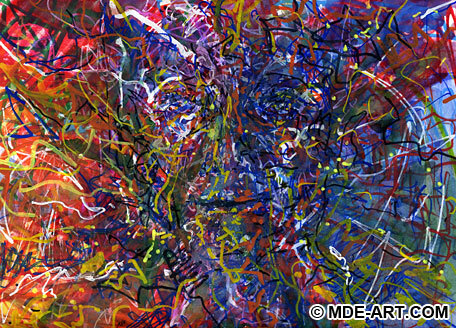 The painting is primarily black and white, but hints of yellow, blue, and orange permeate the entire abstract artwork. 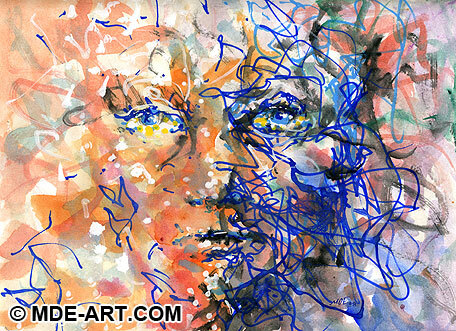 This is a series of expressive abstract drawings and paintings of colorful faces. The artworks are 9″x12″ and use a variety of colored mediums to achieve the desired look, including Oil Pastels, Paint Pens, Watercolors, Markers, Pens, and Acrylic Paint. 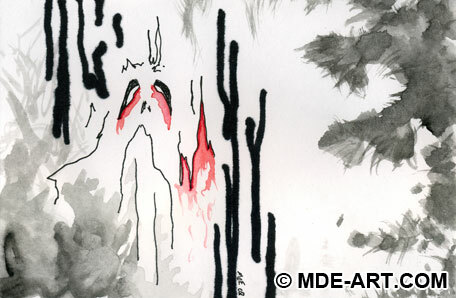 They are drawn from memories and intend to convey the essence of a mood or feeling evoked from people or characters. 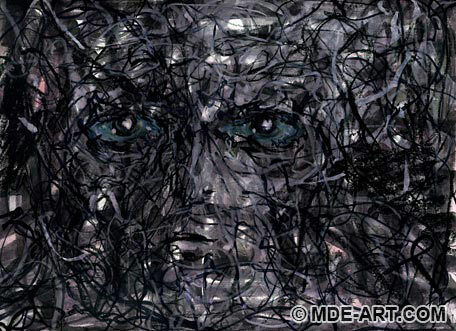 The layers, expressive lines, and abstract compositions help communicate the complexity of imagination, and represent the emotions that arise from a perceived connection to faces. 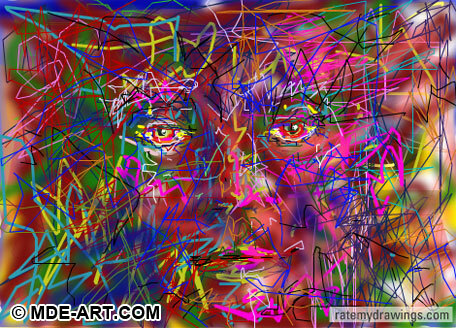 These are drawings and paintings of abstract faces. The 9″x12″ artworks use black and white colors from a variety of mediums, including Pens, Paint Pens, Watercolors, Oil Pastels, Markers, and Acrylic Paint. 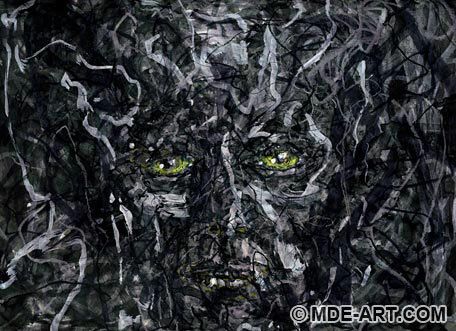 Each artwork has multiple layers of medium which adds depth to the faces. Alternating patterns of light and dark values resemble highlights and shadows. I drew them based on subtleties in the emotions of anger, despondence, frustration, empathy, and a bit of hope. 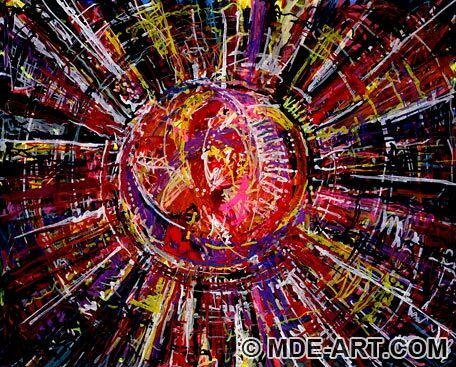 These are two acrylic paintings, one of an abstract Ball or Sphere, and one of an abstract Cone. 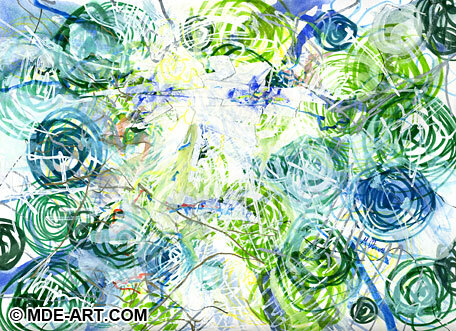 Energetic and expressive swirls of color are chaotically focused on creating a recognizable image. And the darker shadows and horizon lines help to ground the objects. Simple three dimensional shapes, like cubes, spheres, cones, and cylinders, were some of the first objects I drew when I started my art hobby as a kid. The basic shapes helped simplify the world, and I began to understand how light and dark play against each other to create depth. As a young adult, the more I learn about the nature of the physical world, I understand there is more complexity than can be perceived by senses I’m accustomed to using, like sight and touch. So the paintings are a reminder of invisible depth in unobvious places. The Sphere (ball) painting is approximately 11″x11″ and the Cone painting is approximately 13.5″x14″. Both artworks are painted on masonite board. Some days feel a little blue. 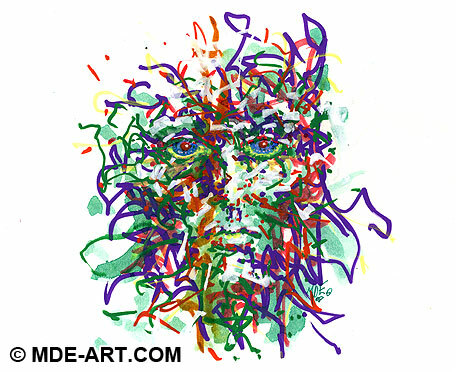 This is a 4″x6″ 2-layer laminated drawing of an abstract face. 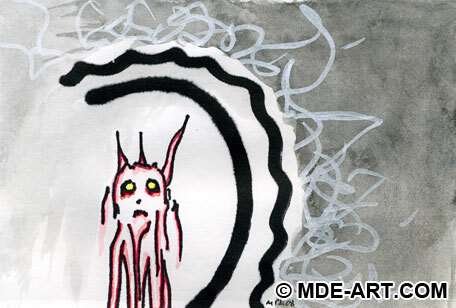 Mediums used include pen, marker, and watercolor. The first layer consists of the blue background and face drawn directly on the paper. The drawing was then laminated, and paint pen and watercolor was used to apply the light blue wisps and blobs of grey color. The entire drawing/painting was then laminated again to seal in the little blue world. I get it, but no thanks. At least not today. As much as I appreciated all my art teachers when I was younger, I think I would have liked less focus on accomplishment or the end result, and more on the process of learning and building. There is so much sustainable joy in action. Some days I just want to push. Bring the art to its limit until it breaks… watch it break down, learn from it, put it back together and smash it again. It’s like playing, which is part of learning and creativity. I want to do more than make mistakes… I want to lift them up, and turn on the flood lights. Swing ’em around and test their stability, study them close, cover them up to see what shows through, highlight it and build off that. What a mess!! 🙂 Yes. Putting some paint on paper is a pretty safe place to make mistakes. And the best part is learning to trust myself more than anything… that quiet authentic awareness in between thoughts… and what I came face to face with was that a lot of my “mistakes” were just my own ‘thoughts with judgment’. It’s not easy to let those thoughts go, after all, they’re there for a reason… maybe to protect my ego against criticism, i.e. staying within the lines means you get a gold star. But today I’m pushing for authenticity. With so much attention on process and subjectivity, it’s difficult to focus on the end result and present it with coherent significance. There were so many faces created and destroyed within this artwork, it feels to me like the last one can barely hold it all together. And maybe that’s honest. 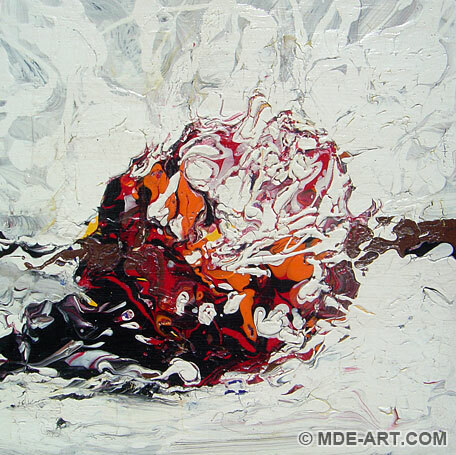 This abstract painting of a face isn’t the final representation of my authenticity… it’s a painting of the active struggle (push) to find my authentic voice, and the joy and frustration that goes with it. 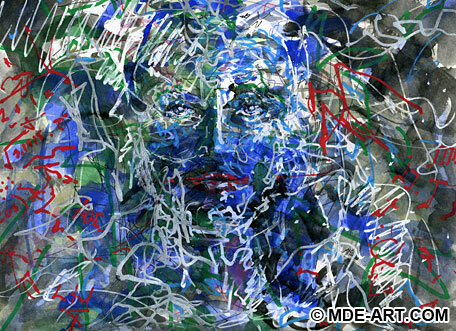 This is an abstract portrait painting of an Art Goddess. 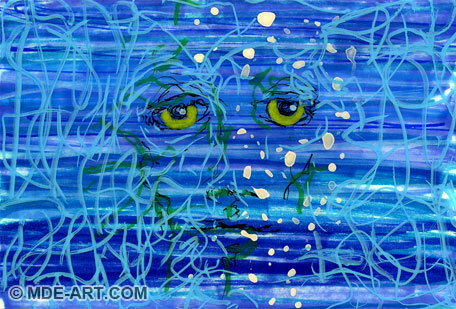 The artwork is 9″x12″ and was created with pens, watercolor, paint pens, and markers. 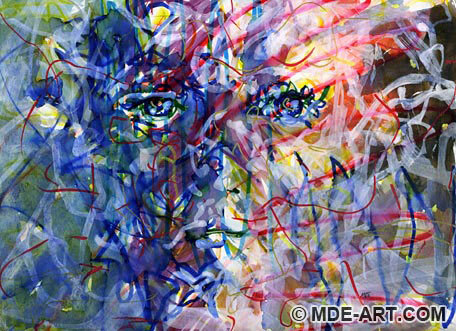 Multiple layers of medium were energetically and organically built up to create an abstract female face, with broad strokes of watercolor and detailed pen lines used to push and pull the space. The essence of creativity is playfully depicted as an Art Goddess, with the face as an almost universally recognizable lead in to the visual art. As I’ve grown into art, I realized that I have developed a deliberate way of expressing myself visually. Perhaps the same way that some have a deeper understanding of other tools for expression and communication, like math, language, or music. I feel a deep appreciation for those other creative processes, even though I don’t understand the intricacies of them, I know there are areas of overlap and mutual insight. So I added a few subtle reminders of other tools that enrich and nurture visual art. I also wondered, if more people were taught to convey emotions or concepts via color and shape more consistently, what new ways of thinking about the world would we discover? What unknown creativity awaits behind the Goddess’ eyes? And what flashes behind yours? Some days before I draw, I close my eyes and breathe until I’m close to a kundalini state of mind, and I start to see amazing faces of all kinds. Barely captured in the artwork, the faces are so real, so unlike anything in this world, it feels like more than just imagination. Like my eyes have to close to this world in order to open in another. There is a gamut of emotions they express, extreme details, and some that seem to embody the very essence of words like “beauty”, “evil”, “fun”, and some… I don’t think there are words to express what they are. I’m not consciously controlling the faces, they move, come, and go on their own, but I’ve never seen them before with my eyes open, and I don’t know where they come from. I drew a picture that echoes the experience. 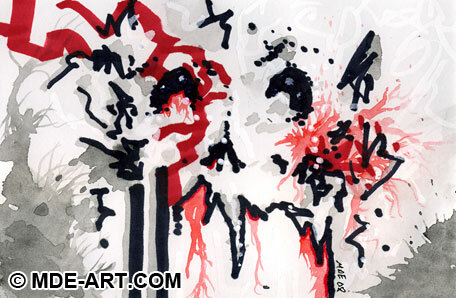 Theses are abstract drawings of skulls, sketched with markers, watercolors, paint pens, and artist tape. 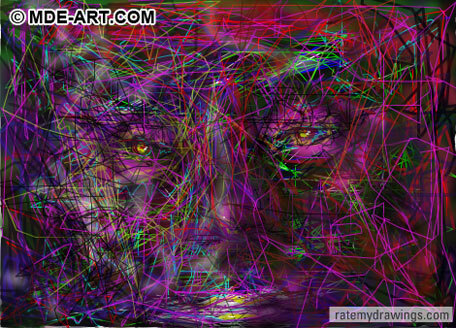 The acid free tape was layered over the eyes of the more abstracted green swirly drawing. A bandaged or mummified appearance hasn’t translated as thoroughly to the digital reproduction. 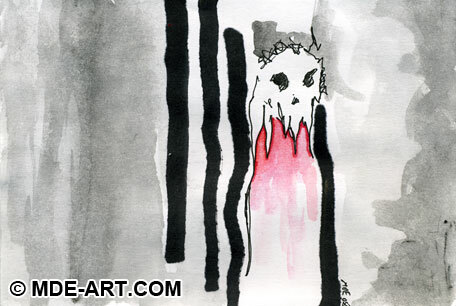 The skull drawings use basic shapes of color, subtle lines of structure, and semi-opaque washes of watercolor sketched quickly and energetically. 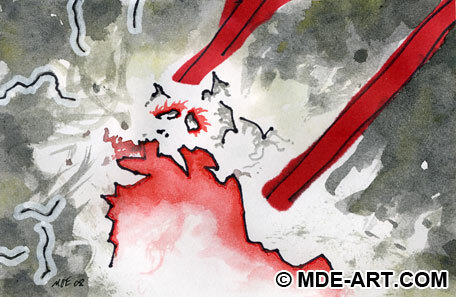 A white paint pen is also used to add interesting hot spots of washed out color and blur lines that intensify the subtle illusion of movement. 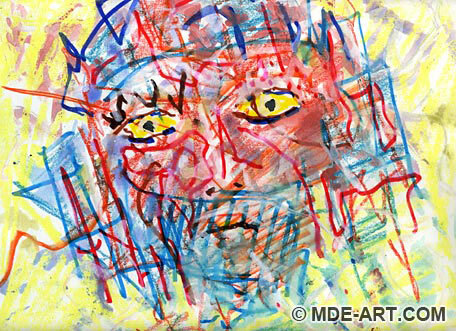 This is a series of abstract impressionistic art faces that were drawn and painted with a variety of mediums in 2008. The shapes of the faces were built up with layers of paint pens, watercolor, ink pens, acrylic paint, crayons, markers, and colored pencils. 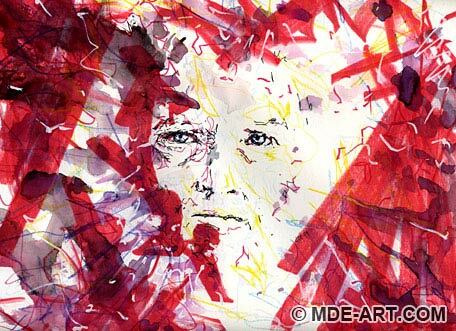 Each abstract head painting has an unusual expression, and struggles to find a clear identity amidst the chaotic and energetic lines and colors. 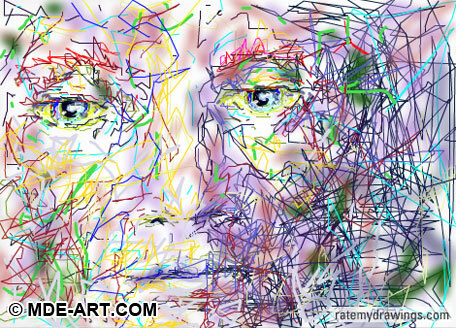 The art usually starts with a simple pen drawing of a face, and layers of medium are applied to distort, contort, and emote from the initial framework. 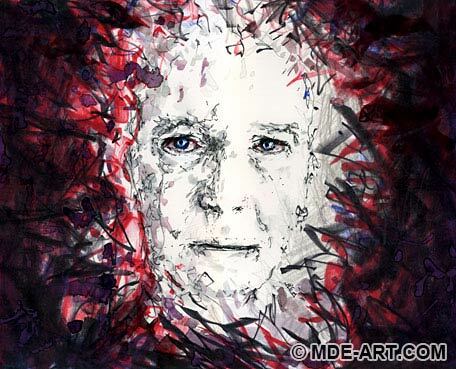 The eyes in particular help to ground the abstract artwork with a familiar image that most peoples brains are able to identify for survival… faces. 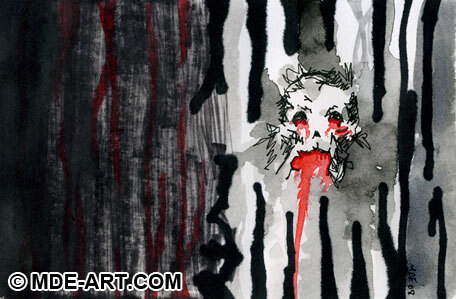 This is a series of pen and ink drawings called Macabre Series 1 – Blood, Skulls, and Paranoia. Each drawing was sketched to stand on its own, but there is a theme in the style, subject matter, and overall feeling of each artwork. 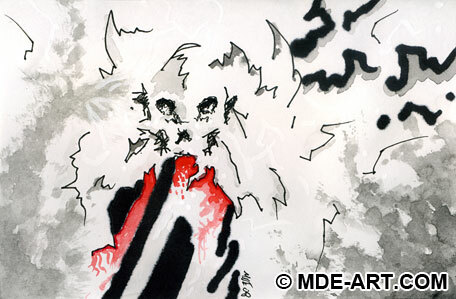 Deep black shadows and abstract designs mix with grey and red gradients to create symbols and images that typically represent death, invoke fear, and suggest an undercurrent of foreboding. Some of these elements specifically include skulls, ghosts, insects, unusual creatures, red coloring for blood, and abstract distorted faces. Each drawing is approximately 4″ x 6″, and each artwork was drawn and painted in 2008 with pen, ink, marker, and watercolor mediums. 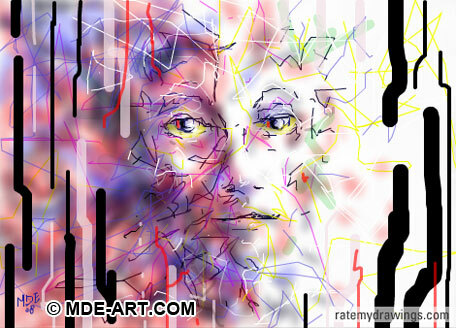 The following artworks were drawn in a digital format, with a mouse as the input using free online software at RateMyDrawings.com. The software also records the drawing process, so once the drawing is complete viewers can watch the drawing being created in a time lapse animation format. 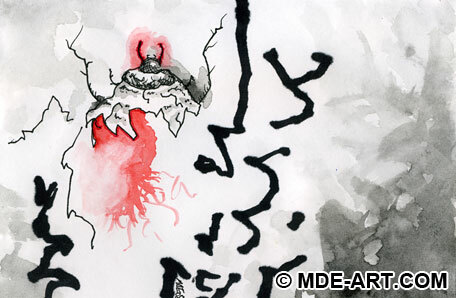 After the animation plays, the viewer may Rate or Comment on the drawing or artwork. 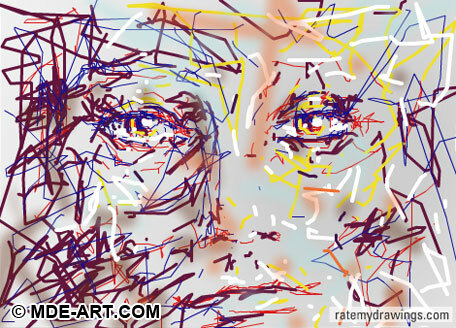 A few digital drawings of abstract faces and portraits that I created at “Rate My Drawings” are highlighted below, along with one time lapse animation. I encourage clicking on the artworks in order to view more animations that show how the drawings were created over time. If you would like to see more time lapse animated art, check out my complete MDE-ART Rate My Drawings Profile, or surf around the site and check out all the other great drawings people do every day. Sign up is quick, so you can try creating your own digital paintings, drawings, and animations too! Copyright © 2019 MDE Art Blog. Powered by WordPress. Theme: Spacious by ThemeGrill.